Our Sisters are often featured in local and national news organizations. Links to those articles are posted here. Sister Anne Schulz is mentioned in an article about the Blue Ribbon Award for MTCES. An article entitled PBMR Outreach grows over 16 Years mentions Sisters Carolyn Hoying and Donna Liette. An article entitled A case for November as our liturgical pinnacle written by Sister Mary Garascia for their Journey toward holiness series. Sister Mumbi Kigutha was interviewed about her participation in Nuns on the Bus. Sister Donna Liette writes about a member of the Mother’s program at PBMR in Chicago. The Spiritual Center through the years and photos from the open house. Precious Blood Sister LaKesha Church professes first vows. Sister Mumbi Kigutha is featured in an article about the Together program. Precious Blood Sister Mumbi Kigutha professes first vows. Q&A with Sister Marifé Hellman. An article entitled Silence allows us to contemplate our God written by Sister Mary Garascia for their Journey toward holiness series. An article entitled The Real Presence: Christ is with us throughout Mass written by Sister Mary Garascia for their Journey toward holiness series. Sisters of the Precious Blood are mentioned in a segment about the Maria Stein Shrine of the Holy Relics. To view the video, click here. An article entitled Encounter on D.C. subway offers Resurrection lessons written by Sister Mary Garascia for their Journey toward holiness series. 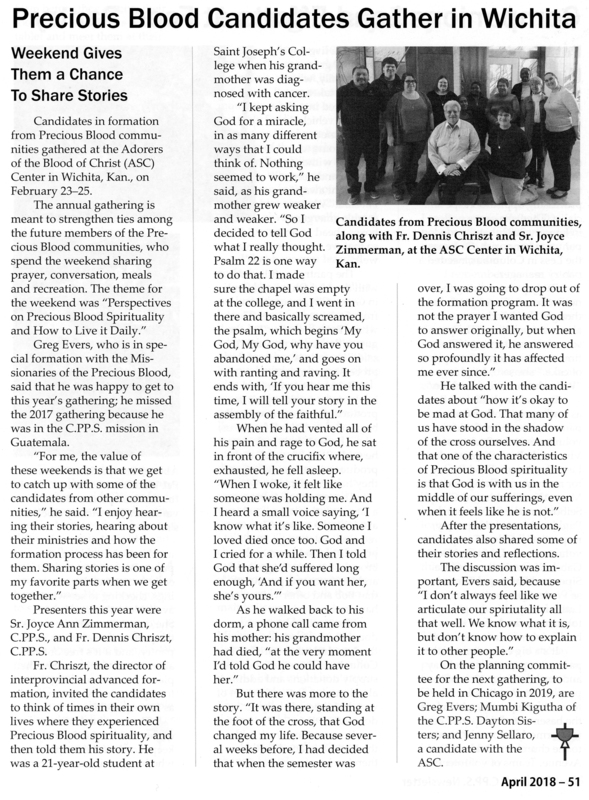 An article entitled Precious Blood candidates gather in Wichita. Sister Anne Schulz is mentioned in an article about a local school started in a church basement and its continued growth. An article entitled To combat aberrant sexual behavior, Church must teach relationship written by Sister Mary Garascia for their Journey toward holiness series. Sister Anne Schulz is mentioned in an article about her upcoming retirement. An article about the life of Sister Gladys Marie Lowe. Sister Anne Schulz to retire at end of 2018-19 school year. A Q&A with Sister Donna Liette. Sister Donna Liette reflects on the progress made in 2017 at PBMR in Chicago. An article about Sister Mary Wendeln advocating for DREAMers. Maria Stein Shrine completes transfer of land deed. An article about Sister Regina Albers’ retirement.